After the gross incompetence of Marvel's first cinematic crack at one of its intriguing lesser-tier characters, I can't imagine anyone was altogether excited for a sequel to 2007's Ghost Rider. The fact that a sequel has come five years after the fact only compounds the general indifference that surely greeted this project. Nevertheless, Marvel outdid themselves in selecting Neveldine/Taylor to replace über-hack Mark Steven Johnson at the helm. The duo behind the frenzied, magnificently obscene Crank films could bring a refreshingly seedy and gonzo approach to this grindhouse-friendly comic book hero, and suddenly the hysterical miscasting of Nicolas Cage in the first movie became a boon. The thought of the craziest filmmakers in America working with the craziest actor in America seemed too good to be true. Unfortunately, it is. If Marvel was willing to give this franchise another go, they clearly weren't going to invest much in it, and the result is a film that, in many ways, looks less professional and polished than the works Neveldine/Taylor did as underground filmmakers. Given barely any more money than they received for the excellent, criminally underrated Gamer and expected to make a more CGI-intensive film, Neveldine/Taylor must retreat to Romania to shoot, something they themselves mock with a location card vaguely reading "Eastern Europe." But that's one of the only things the irreverent duo take to task with the film. I was all set for a Grand Guignol travesty of the comic book film, because God knows that's what the genre could use right now. After last year's middling crop of franchise films made for a tepid summer, a full-on genre assault would be more than welcome. And even with the PG-13 rating, I expected a certain amount of chaos and inappropriateness. While there are elements of both, Ghost Rider 2 sadly feels bereft of the anarchic streak of experimentation and almost gleeful offense that categorizes Neveldine/Taylor's output. It starts off well enough, hysterically bypassing context as Idris Elba interacts with monks (including one played by Tony Head!) and ends up in a shootout to protect a mysterious boy (Fergus Riordan). The duo's usual camera tomfoolery further disorients the audience right off the bat, with such wild shots as an inverted tilt that suddenly morphs into a fast-descending crane shot. When thugs burst in on this medieval castle and start killing monks, everything goes crazy as Elba's character races after the aforementioned lad and his mother (Violante Placido), who does not seem to realize he's trying to help them. Sped up shots and an amusingly prolonged slo-mo bit further mess with the crowd, and Brian De Palma's old stance on the importance of beginnings in throwing audiences off their game is beautifully embodied in these frantic early minutes. Then, everything slows down. Way down. This is the first movie Neveldine/Taylor have directed without writing, and it shows. Odd lapses in momentum characterize the film, with exposition needlessly weighing down the proceedings at every turn. The basic story takes no time to explain: the boy being fought over at the start, Danny, is the literal spawn of Satan (Ciarán Hinds, replacing Peter Fonda). The Devil, weakening in his corporeal state, needs to transfer his essence into the child to create a new, more powerful body, leading to the end of the world as we know it. Moreau (Elba), a member of a secret Christian brotherhood, recruits the Ghost Rider (Cage) to protect the boy until the prophesied day of the apocalypse passes. If Johnny Blaze does so, Moreau will lift his curse and free him from the pull of his demon spirit. There. That summary was still somewhat convoluted, but there's everything you need to know. Why, then, does the film suddenly pause after every single action scene to waste another 10 minutes rehashing all this? Even the directors grow weary of all the exposition, occasionally employing their techniques to distract from the plodding nature of the dialogue. Random cutaways to Moreau hanging from a cliff or the Ghost Rider peeing fire and nodding proudly at the camera suggest that the filmmakers' ADD sympathizes with the audience's boredom. Those moments suggest the real Neveldine/Taylor, itching to toy with conventions and dismantle expectations, and the critics who find them misplaced are, I think, wholly missing the point. The pair also encourage Cage to go hog wild with his dialogue, leading to scenes that prioritize insanity over exposition. The best scene of the film shows Cage intimidating some underworld information broker for the whereabouts of Ray Carrigan (Johnny Whitworth), Nadya's former lover and the henchman hired to abduct Danny. Trying to hold back the Rider from coming out, Cage devolves into tics and jerks as his voice bends and squeals like overheating brakes. It is sublimely ridiculous, and the one part of the whole movie that lives up to the promise of Neveldine/Taylor directing Nicolas Cage. Sadly, the nature of the Ghost Rider means that every time the actual superhero is on-screen, Cage isn't. Nevertheless, the makeover of the Rider's CGI appearance, though still a bit wonky, is a vast improvement over the laughably bad conceptualization of the first film, where the flaming head looked like it had been taken from abandoned animation from the Doom III video game. This Rider looks grimier, his skull more blackened and his riding gear subtly bubbling from the heat. In the first film, the Rider lumbered like a robot, mechanically forcing penitence onto his victims. Here, the Rider's head darts like a bird's, curious and malevolent as it roars and taunts. The Rider's ability to turn whatever it rides into a flaming conflagration leads to one gloriously OTT sequence at a construction yard, where Javelin missiles are fired directly into the beast's chest to no avail and a massive piece of construction equipment becomes a blazing fireball. In such moments, Ghost Rider 2 achieves a glorious stupidity that is at least agreeable, even if it doesn't match the defiant tastelessness of Neveldine/Taylor's other work. Cage and Elba have fun being campy, and they make up for the hopelessly dead performances of Riordan and Placido. Hinds, too, is a step up from Fonda's vaguely enticing devil, playing Satan with a weariness that flecks his sinister calm with a desperation that makes him erratic. These players elevate the film, and the directors make it borderline transgressive when they really kick into high gear. 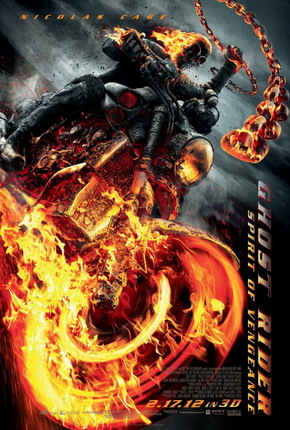 Sadly, though, Ghost Rider: Spirit of Vengeance too often feels woefully conventional and dispensable. In a recent appearance on the (excellent) podcast How Did This Get Made?, Brian Taylor alluded to him and Neveldine being modern grindhouse filmmakers. That clarifies a great deal of the choices made with this film, with its stripped-down, occasionally gonzo style and frequent narrative halts. But for those of us who see the duo as the heirs apparent to Brian De Palma, merely making C-grade trash feels like a waste of potential for the most revolutionary mainstream stylists in decades. Big fans of the filmmakers I see. Crank and Gamer were silly, though mildly enjoyable. You make some unique points - and there are parts of me that enjoy a "Brian De Palma" b/c movie type of filmmaking. I just can't do this. Nic Cage. Fire.